Follow my postings republishing past features, articles and reviews from my former magazine “Darkroom User” – later renamed “Camera & Darkroom”. Most postings will be by me – former publisher and editor – with occasional guest posts or reprints from those writers who want photographers and darkroom users to benefit from the reuse of their writings and photographs… so read on, learn and enjoy ~ Ed Buziak. 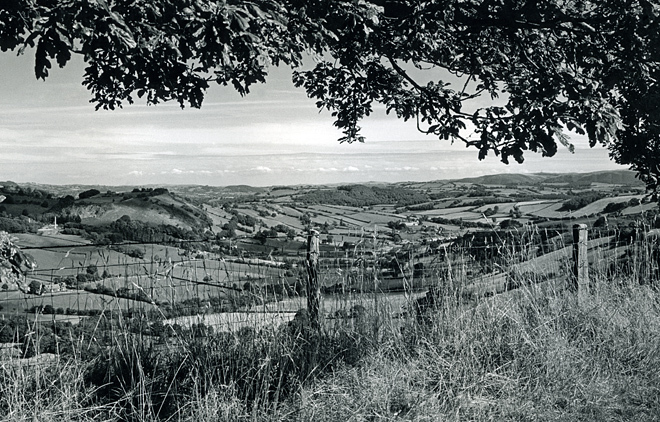 The above image, looking across the Van valley near Llanidloes in mid-Wales, was taken with a Minolta 9000 AF camera, 28mm f/2.8 Minolta lens and deep yellow filter using Neopan 400… and the resulting print is virtually grainless at 16×12 inch and very sharp. Really it’s a matter of preference and what an individual photographer feels comfortable working with. After all, why change just for the sake of changing when it may have taken many hours, months, years of experimentation and many rolls of film to arrive at the so-called “perfect combination” of exposure index (EI) rating with your own camera, meter, favorite developer and development time to get the optimum balance of tonal quality, sharpness and grain (or lack of it) in a print. Most monochrome films have been around for many years… all of Agfa’s APX range were highly regarded emulsions across Europe and especially in Germany (of course as we all know Agfa has now been liquidated! ); whilst Ilford’s FP4 and HP5 Plus are firm favorites with British photographers (Ilford’s situation was also once uncertain but has been resolved to the good)… and the venerable Kodak Tri-X which has been in many, especially American, photographer’s cameras for over half a century. There are also some lesser known emulsions from Czechoslovakia (Foma), Hungary (Forte) and Bergger (France/Hungary) which will gain popularity with photographers who have to consider price as a prime factor. All these makes, as well as other specialized emulsions from Polaroid (there may be some photographers with stocks of Polaroid’s discontinued instant 35mm films) and Konica (Infrared) can leave one in no doubt that the monochrome photographer is as well served as the color worker. However, there is more good news… the Japanese film giant Fuji also has a range of excellent black-and-white emulsions, two of which are well established in Europe and America and two others (Fuji Acros) recently introduced in Japan which I will describe another time if they are cataloged as “stock” in Europe rather than being a specialist import by an enterprising dealer. The reason, of course, is that most modem emulsions are now so good when properly exposed and carefully processed that slower, potentially finer grain films are not required for everyday photography. The characteristic large grain associated with the faster films which we once used for action stopping sports and available-light candid photography is a thing of the past… we can now use films with an EI rating up to two stops faster than twenty or so years ago with the same result, or better, and with much more convenience. There has always been a principle that the larger the film size the better the quality of the result…. all other things being equal. In practice, though, this happens less than is realized because the smaller 35mm camera makes photography possible whereas the use of larger cameras is often inconvenient. Remember the evolution of the Leica! Because modern films have become so good it is now possible to load film two stops faster into a camera, fit a prime focal length lens or a high quality zoom, use a fast enough shutter speed to enable the subject to be recorded sharply and, even if relying on the camera’s built-in exposure meter and auto-focus features, after correct and careful processing obtain a print of remarkable image quality. In fact with most developers from the “industry standard” Kodak D-76 / Ilford ID-11 to newer “high definition” developers such as Paterson FX-39 grain is almost non-existent. But, is that a good thing? 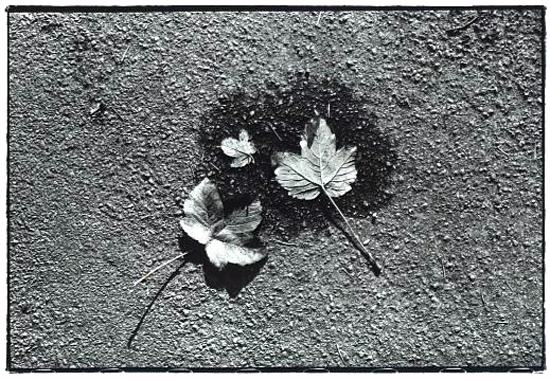 The above image of sycamore leaves stuck to an oily patch of road was taken on Fuji Neopan 1600, is virtually grainless on a 10×8 inch print, and very sharp. Fuji Neopan + Agfa Rodinal… wow! When I make prints from negatives taken between ten and thirty years ago I notice that most of the prints display a “gritty” feel which gives them more impact. This, to me, is the essence of personal black-and-white photography and it definitely has more “feeling” than the almost lifeless quality that, for example, resulted from my use of chromogenic black-and-white film (chromogenic monochrome films are processed in C-41 color negative chemistry) in the late 1980s. This, coupled with a return to using Leica M and Nikon F2 manual cameras from the 1950s and 70s, as opposed to AFs of the 90s, has redefined “monochrome” photography for me. But, what is the combination of film and developer that replicates those negatives without the inherent coarse grain, high contrast and high density that was the result of less than careful processing in those long gone days? I have in fact found an ideal combination with two of the newest films on the market, Fuji Neopan 400 Pro and Neopan 1600 Pro, processed in the oldest commercially available liquid developer… Agfa Rodinal, which was formulated well over 100 years ago. With this combination I initially thought that film grain was going to be revealed as the size of rice grain… especially with the 1600 speed emulsion. But from a normal viewing distance a 25 x 20 cm print made from a Neopan 1600 negative (such as the shot of leaves on a road) has remarkably fine grain and strong tonal qualities… albeit with a slightly hard contrast which I find attractive. Having made comparison prints using Neopan 1600 in a 35mm Nikon and Ilford Delta 400 in a Mamiya 645 Pro roll-film camera, (the opposite of the normal faster 120 roll-film versus slower 35mm film contest), whilst the roll-film negatives definitely had a smoother tone, which was to be expected, they lacked an interesting “feel” because they were too close, or too accurate, to the original subject. Whilst this is fine for straight photographic recording of much subject matter it’s not usually what a creative photographer wants. Having tried the faster of the two Neopan emulsions first to see what creative and “emotive feelings” the negative could produce I then turned to the slower ISO 400 film to see how it compared to the ISO 400 emulsions of the past. Over a period of several months I used Neopan 400 as my standard film for landscapes, portraits, still-life, interiors, auto rallying and so on and so forth. The startling conclusion I have come to is that there is possibly no apparent need for a much slower ISO 100 film for general photography. Okay, there will always be subjects and situations where the finest detail and lack of grain are prerequisites for a photograph, but in general Neopan 400 film is good for most things. Considering, therefore, the still universal appeal of the 35mm camera, it’s not surprising that Fuji have strengthened their position in this marketplace. Initially the company aimed Neopan Professional at the press photographer who had to take photographs of all types of subjects and situations, in all kinds of lighting conditions from daylight to tungsten and flash… and process them in all sorts of facilities from newspaper offices to makeshift darkrooms in hotel bedrooms. The most demanding application, however, is when the film is “pushed” for more speed. Here both Neopan films excel – the technical information sheets indicating that the nominal ISO ratings of Neopan 400 can be extended to EI 800 or EI 1600 whilst Neopan 1600 can be rated at EI 3200 in a wide variety of developers including D-76, ID-11, HC-110, Microdol-X, T-Max, Microphen and Acufine. Although these are aimed at the U.S. market, the German photographer is also well catered for with developers and times from Agfa with Rodinal and Atomal as well as Tetenal including the Neofins, Emofins, Ultrafins and Neopress. The above kitchen utensils were shot with an old Nikon F2 and even older and rare 1960s 105mm Bellows Nikkor on a PB-4 using Neopan 1600 rated at EI 6400 push-processed in Kodak Xtol at 1+1. You cannot see it on the screen scan but the grain is exceptionally fine for the pushed speed rating. When Fuji Neopan films are compared with other maker’s emulsions they will be found to have high usable emulsion speed. For example, Neopan 1600 is near enough a true 1600 and reveals printable shadow detail when exposed at that rating… whereas Kodak T-Max 3200 is regarded as being neared to 1600 (and some say 800) than its nominal speed. In fact quoted high speeds are often not true speeds but the maximum “pushable” speed (a useful marketing exercise)… whereas their true lower ratings are the speeds at which maximum quality is available, that is, there is printable shadow detail in the negative. Of course it follows that a speed rating above that figure results in an increase in contrast and a loss of quality. Considering that many photographers (myself included) lower the speed rating of most black-and-white films by one stop, ie. ISO 400 films are rated at EI 200 in order to record more shadow detail, it becomes apparent that the use of slower, fine-grain emulsions in the ISO 125/100 range are more difficult to use spontaneously because their usable speed drops to EI 64/50. The gain in visual quality – finer grain and better tonal range and sharpness – is offset by the practical working disadvantages of shallower depth-of-field, slower shutter speed, smaller flash working distance and possibly the use of a tripod, unless the lighting conditions are good enough to counteract these problems. These arguments and the high quality available nowadays from fast films is why professionals using film rarely use anything else. Amateur photographers, though, have different requirements. They do not have to work with difficult subjects, under adverse lighting conditions, and against tight time deadlines… they can choose to, but are able to retake their photographs several times if at first they didn’t succeed. On the other hand amateur photographers are able to explore personal creative photography and to experiment with films; and I have been in a position, as a photo magazine publisher/editor, to see much of it in Fuji sponsored black-and-white print competitions. 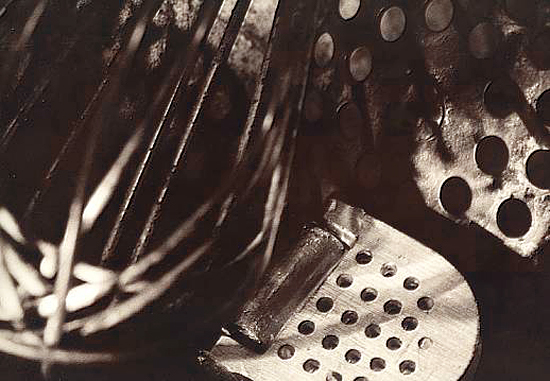 The subjects and treatments were as varied as would be seen anywhere and the qualities of the two Neopan films were explored to the full. From my own experiences I can say that the negatives were very easy to work with. Nearly every print I have made from Neopan negatives is “straight” with hardly any burning-in or dodging manipulations necessary and nearly every negative prints easily on a normal grade 2 or 3 paper. This is what most photographers want from a film and Fuji appears to have provided it with their Neopan double act. Whilst Neopan 400 Professional is available in 35mm 24-exposure and 36-exposure lengths and in 120 rolls the Neopan 1600 emulsion is only available in the 135 size (both at one time being available as bulk 30.5-meter rolls for darkroom loading). As I said before there are other Fuji black-and-white emulsions available in Japan and some European countries… they do have an excellent reputation from those who have tried them but whether they will be marketed properly and adopted by discerning photographers in this digital age is another matter.